After I ventured into the restroom at Cosco, I headed out with a great new idea for a comedy scene that I've since added to my work in progress (WIP). It all began when I stuck my hands into the automatic hand dryer, and I thought what would that goofy kid Slater do with this device? Next I knew, I was laughing out loud at my keyboard. The $1,000,000 question: Do you think my scene is funny? “Cool, Knob! Look at this.” He pointed to an automatic hand dryer with two silver slabs that faced each other. The top part had a section that curved outward to allow room for a guy to stick his hands inside. A bright yellow line did a crappy job at trying to make the machine pretty. Slater lowered his hands into the drying machine and caused a deep swooshing sound to fill the bathroom. The motor yelled so loud, I could barely hear him speak. “Maybe there’s a way to push these panels out.” I patted the bottom of the machine for some sort of lever but didn’t find anything. That wasn’t good enough for Slater. He lifted his hands out, leaped onto the floor, and nosed up under the dryer. I couldn’t help but think of all the dirt on a bathroom floor. Slater ignored me. “Here it is.” He flipped some kind of switch and the panels spread outward. “I need it to dry my hands. Hope it still works.” I lowered my fingers into the dryer. Even though the panels were further apart, my hands got dry. I just had to move them around more. After I pulled them out, I rubbed the back of my dry hands. “Hey, Knob. Watch this.” Slater lifted himself to his knees and put his head into the machine. The engine roared and noisy air shot out of the panels. The skin on Slater’s cheeks wiggled back and forth like a bulldog shaking loose jowls. As Slater giggled, he must have hit something because the panels moved inward and snapped. Slater tried to move his head out of the machine. As much as I hated being on that dirty floor, I got on my knees and looked around for the lever. Finally I found it and freed Slater. When he stood up, his cheeks glowed red and his once centered Mohawk had shifted to the left side so that it shot out of his head like a one horned elk. Singed hair lined the tip of his Mohawk. I hope someone will find this scene funny; but if not, I had a blast writing it! When I was a little girl, a teamster broke my uncle's leg and caused him to carry a cane for the rest of his life. Note I said, "Carry a cane," since he rarely leaned on it as he'd race through the family furniture store. See Uncle Melvin was in business with my father, and he made the mistake of crossing a picket line. As a result, I grew up surrounded with tales about how horrible unions were and how much trouble they caused. As a child hearing about the cursed unions, it never dawned on me to ask, "Why were they picketing?" or "What did they want?" These were adult type issues that weren't discussed with kids. Of course I have no doubt that these men were not "nice" people. After all, the picketer attacked a business owner, but I'd like to hear his side of the story. Today all the players are gone, and I'm suddenly left to wonder what exactly happened. Especially when I find myself in a union that is being unfairly targeted by politicians out for pay back. Tennessee Education Association (TEA) has consistently funded those who support our concerns, mostly Democrats but not all. Now that Tennessee has been taken over by the Republican party, congressmen are out to destroy teachers with highly punitive measures. House Bill 130/Senate Bill 113 would repeal the Education Professional Negotiations Act and make any bargaining by teachers in the state illegal. House Bill 159/Senate Bill 136 would prohibit payroll dues deduction for public employees thereby making it more difficult for teachers to maintain membership in their chosen professional organization. House Bill 160/Senate Bill 139 would make it illegal for the Association's political action committee to make contributions to any candidate, thus prohibiting teachers from helping to elect/re-elect legislators who have worked to improve and protect public education. This is just a sampling of the bills floating through Nashville; there are more. As someone with an anti-union upbringing, I'm finally seeing the other side of the coin and wondering what caused the Teamsters to picket. I plan to march too. I promise I'm not going to break a congressman's leg, but I will wear red and head to Nashville come March 5th to rally the capital. We'll be meeting at the Bicentennial Capitol Mall State Park and marching at noon. If you are able, please join us. We will be less violent than the Teamsters of the 1960s, but we will not stand quietly. "My mother was a Moon. My father was a Glampers." My favorite role of Diana’s was as the button pushing general who would scramble the thoughts of intelligent people by causing plane wreck noises in their ears. If you’ve never read Vonnegut’s short story, “Harrison Bergeron,” check it out. Although I’m no Kurt Vonnegut, I do have a character—or rather a group of characters—who will often make appearances in my books. I’m referring to my fictitious, metallic rock band, Leaf Jet 8. This group acquired their name by me randomly tapping computer keys then shuffling the letters around for a name that grabbed me. I’ve found success with this technique many times. I delight in putting the band into each of my books, whether it’s something as mild as a song on the radio or as the main character’s girlfriend’s infatuation making her run off with lead singer Dallas Quinton. I’ve also had a good old time making up song titles to fit various scenes. Among the band’s greatest hits is Jenna’s Jugular, which was named after the lead singer’s ex-girlfriend Jenna who dumped him for a woman. Other hits include The Hellivator and Hold Up Baby. Leaf Jet 8 may never make it onto a real stage, but they provide hours of entertainment as I enjoy cameo appearances coming to a radio near you. So what pops into each of your stories? You can enter too by heading to http://rantsnrascals.com/2011/02/country-bobs-all-purpose-sauce-review-and-giveaway.html, but hurry. The contest ends tonight! I first met Irene Latham and heard about her book, "Leaving Gee's Bend," at a Midsouth SCBWI Writer's Conference. 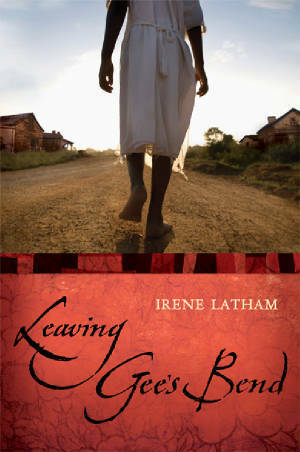 Although Irene is a nice person, I honestly had no desire to read a book about people stitching quilts in the south. Boy had I misjudged her book! I thoroughly enjoyed Irene's delightful tale of Ludelphia Bennet, a poor African American girl from the 1930s, who only wanted to save her dying mother by traveling to Camden to bring Doc Nelson to her mom's bedside. I found myself quickly engaged in this book and wanting to read any chance I got. Ms. Latham also captured Ludelphia's voice as if she herself had lived this life. I would highly recommend "Leaving Gee's Bend." It's interesting how the stomach flu creeps up without warning yet leaves a path of destruction. It all happened Tuesday night around nine o'clock when I decided I didn't feel great--not awful or sick--just not great. I washed up and climbed into bed even though the weather report would soon be posted, and I had to know about the approaching snow storm. I turned off the TV before the ten o'clock news had even started. Around eleven, my world came crashing in as a sickening light-headedness kept me from laying still. I felt like I'd pass out any moment, and maybe did, yet knew there was no place to go since I was already lying down. Poor Millie dog got bopped on the head by my exorcist-controlled flailing arms. The dizziness left suddenly, so I think I'd awoken from being unconscious but am not sure. Then came the gross part that no one wants to read about, and the entire scene repeated at one AM. I've been blessed with a wonderful husband who changed the sheets while I draped my head over a plastic bucket and my other half on the porcelain thrown. I didn't eat much on Wednesday--a few bites of applesauce and some broth from soup. The thought of eating anything tomato based scares me to no end. Luckily, I kept everything down on Wednesday, and so far today. My stomach is not one-hundred percent; I can tell, but I'm much better than before. I've eaten mostly liquid but did eat a small piece of cheese pizza at lunch time. Maybe a mistake, but I haven't seen it yet, so hopefully not. Thanks to the internet for all of the stomach flu advice from BRAT diets to warm lemon juice (that took up half my tea cup). I've also downed quite a bit of Gatorade in the last two days. I hope y'all stay well. This is a situation that I wouldn't wish on my worst enemy.